Twenty-first century technology relies not only on features in computers getting smaller and smaller, but a general drive to work with, control and exploit a huge variety of very small scale, interconnected processes. Our research aims to understand how to control individual atoms and light quanta known as photons. This needs a clear understanding of quantum mechanics, which rules the world at these scales. Light absorption and emission are very well known processes but interaction between light and light also can provide mechanical forces on atoms (optomechanical forces). These forces can be huge, easily then ten thousand times gravity. They form the basis of many applications for manipulating atoms or larger objects like cells in bio photonics. For example, you can use lasers to cool atoms to ultra-low temperatures where they show exotic properties: They are so slow that their wave functions overlap and a condensate with “superfluid” properties is formed, this is called a Bose-Einstein condensate. Two light beams of the same frequency which cross each other create an interference pattern with regular alternations of maxima and minima of light intensity. Due to the optomechanical forces, cold atoms either move to either ends of this interference pattern. This allows you to create a lattice of atoms which mimics the lattice of atoms in a crystal. However this atom lattice has big spaces which makes it easy to analyse and control its manipulation. This is the field of quantum simulations, where we use a well- controlled simple quantum system to simulate more complex, technologically relevant quantum systems. This helps us to understand features like superconductivity and exotic types of magnetism. ColOpt takes quantum mechanics to the next level as the optical lattice beams arise from self-organization with the atoms itself: light tells the atoms where to go to, and the atoms in turn tell the light where to go, bending it similar to a lens or prism. Beyond a certain threshold, this leads to spontaneous structuring, similar to how convection cells form in a layer of oil heated in a pan on a stove. This spontaneous emergence of structures and phases is closely related to collective effects: A large number of atoms (let’s say a billion) do not simply have a billion times the effect on light as 1 atom, but at high densities completely new behaviour emerges, e.g. “superradiant” emission with an intensity of a billion times a billion. The young researchers in ColOpt will use light from lasers to manipulate, image and measure the quantum world with a focus on optomechanical and collective effects. Experimentalists and theoreticians will interact to make sense of the quantum world. Notably, the project contains three companies developing instrumentation for these investigations and being interested to exploit the findings for new products. We are working on the one hand on very fundamental projects and insights but also developing the basis for future quantum technologies. 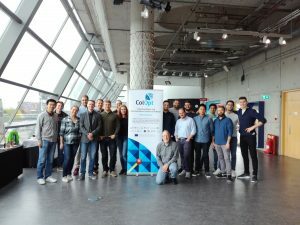 ColOpt will drive the field forward not only by the direct research outcomes, but also train highly qualified, curious and entrepreneurial researchers to take the leadership in the emerging field of quantum technologies.